We adapt Pilates to the person, not the person to Pilates. With the Pilates Process™ approach our concern isn’t that the client performs Pilates well, though that will eventually happen over time. Our aim is that Pilates serves the client well helping them develop more efficiency, greater stability, more balanced power and improved posture. This is not just a slight difference from other Pilates methods – it’s profound. This premise directs us as teachers as to what exercises we choose, how we cue, what order we program and how we communicate. We pick and choose from our vast tool box of exercises and cues, to best serve the individual before us. Teachers learn to assess and adapt to all aspects of the client, as no two clients are the same. This sounds like a huge commitment. And it is. It’s not the easiest path for sure. Learning to be an adaptive teacher is much more gruelling and intensive than being a formulaic teacher. So why this path? Because it’s a thrilling way to teach. Endlessly interesting, effective and engaging. And in the end, it improves how the client moves in their daily life, not just in Pilates class. How do we get teachers to this complex approach in one 60 hour course? Honestly, we don’t. Developing high level skills to anticipate challenges takes a lot of experience. Fortunately, the Pilates Process™ system has built in intelligence, so to speak. Early on, we train teachers to follow the system and keep the awareness open to signs to direct us as to what to program and how to cue. It’s all about the foundation. Our initial training course sets the foundation for all aspects of teaching, far beyond the Pilates repertoire and basic anatomy. Those are essential of course, but communication and the ability to adapt to learning styles and to personalities are sometimes even more key to a successful teaching career. Because we are teaching humans after all, not just bodies. If you have a great foundation, you can layer on knowledge, repertoire and expand your tools with ease. Personally, my favourite element of our PP Mat Training Course is called Body Day. It’s a logistical hassle, time consuming, students initially dislike it, and it’s invaluable. For the first portion of the teacher training course, students practice teach on each other gaining skills and confidence. They are then assigned someone to teach (a body), whom they’ve never met and has likely never done Pilates. This is always a bit jarring. Why don’t they follow what I’m saying? Why don’t they “get it”? Teacher trainers give huge support, feed back and assistance and students always manage to get through it. 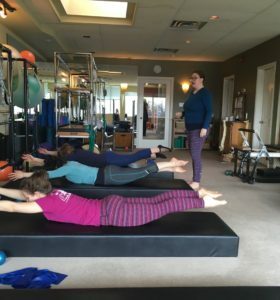 It happens several times during both the mat and reformer courses and is incredibly educational and informative, and immediately improves how students relate to the course material having had a real teaching experience. It is our most positively commented upon training technique. My second favourite aspect is the Facebook Group. Once your training is underway you can access our Pilates Process online teaching community where we post workouts and teaching tips to help you learn, practice and gain inspiration. And that’s needed at every stage of a teaching career. If you’d like to discuss Pilates Process training further, please contact me directly via email. I’m happy to set up time to chat.